Alexlouise Brown (pictured) was trained by Michelin-starred chef Raymond Blanc, she ran her own pub-restaurant and her own catering company. Now, she is sharing her passion for food by teaching people how to go back to basics and make delicious meals from scratch. Once a month, the owner of Alex’s Supper Clubs hosts Alex Cooks The Box at her base in Pontypridd. Riverford Organic Farms vegetable and meat boxes are the centrepieces of every session. The contents change every month – produce is seasonal and from Riverford’s network of farms. Alexlouise, 35, has just a few days to come up with mouth-watering recipes which are simple enough to be demonstrated to and remembered by her visitors without a recipe. Remember how our mothers and grandmothers created meals from available ingredients without ever looking at a recipe? Alexlouise is taking cookery classes back to the future. When I visit, the vegetables include wild garlic, cabbage, courgettes, carrots, rocket, cucumber, spinach leaves, purple sprouting broccoli, onions, potatoes, and mushrooms. The vegetables are supplemented by Riverford organic meats and organic free range eggs, milk, and cream. The only non-UK fruit and vegetable ingredients are bananas – which, of course, have to be imported. Alexlouise’s philosophy is simple: cook using organic produce and cook from scratch. “Food doesn’t have ingredients, food is ingredients,” she says. We’re greeted with a glass of prosecco or her own kombucha, a fermented tea which is slightly sparkling. Alexlouise has added berries to the probiotic drink. It’s refreshing and good for the digestive system. As she expertly slices the potatoes into wedges and sprinkles them with garam masala and cumin, we talk about the toll food processing can take on ingredients. Alexlouise shows us how to spatchcock a chicken within minutes. Her cooking doesn’t require complicated kitchenalia – just a roasting tin or two, a frying pan, a saucepan, one sharp knife, a sharp grater, and a hand mixer. As the chicken and potato wedges roast in the oven, Alexlouise sets to making us her mouth-watering mushroom soup. Solid coconut oil is heated to become liquid, and onions fried until translucent. If no vegetarians like me attend, Alexlouise could use lard. Then, Alexlouise grates in the mushrooms. Water, rather than stock, is added, and the soup is seasoned. It simmers until ready for hand blending and is served in tea cups with a dollop of sour cream and a square of homemade rosemary focaccia. It’s fresh and delicious. We all marvel at how much taste Alexlouise packs into a simple soup. Our six courses include a home-made coleslaw with soft-boiled eggs which lives on a different planet from the runny affair we buy in tubs in supermarkets. The grater is king – carrots and cabbage are grated, mayonnaise is added, and everything is seasoned to perfection. We are also treated to linguini with a tangy lemon and chilli sauce and a crunchy topping of cob nuts, a salad of leaves topped with a balsamic syrup and Indian paneer cheese griddled in Indian spices, roasted, spatchcocked chicken and potato wedges, and Alexlouise’s pudding, a caramelised banana fool. We’re shown how to caramelise sugar correctly – never leave un-melted sugar grains – and how best to coat the banana slices. Cream is whipped and Alexlouise assembles the pudding in champagne flutes, topped with an orange physalis berry on the rim of the glass. At the end of the three-hour session, we’re enlightened, full, happy, and determined to put Alexlouise’s simple recipes into action in our own kitchens. The atmosphere is friendly and relaxed enough to reassure even the most timid would-be cook. Vegetarians like me are welcomed. It’s the perfect foodie night out with friends or family. Riverford Organic Farms franchiser in South East Wales Janet Mier, who is also at the Alex Cooks The Box night, says the sessions have inspired visitors to order regular vegetable and meat box deliveries. “Some people who come along are already customers and have heard about the events through us, but others are inspired by the recipes and the produce and sign up,” she says. Janet serves customers from Penarth and Sully to the Heads of the Valleys and Monmouthshire border to the east, delivering around 850 boxes a week. To learn more about Riverford South Wales, see their Facebook page https://www.facebook.com/RiverfordSouthWales/ and to order boxes call 01633 867661. At 15, Alexlouise went straight from school into a job in a kitchen after a work experience placement at 14. She washed dishes and prepared vegetables, but soon realised she could work her way up. “If you stay in kitchens long enough and you learn, you will progress,” she says. She went on to work in restaurants like those at the Celtic Manor, then worked under Michelin-starred chef Raymond Blanc at Le Manoir Aux Quat’Saisons near Oxford. By the time she was 22, she was running her own pub-restaurant Y Draenog in Pontyclun. A spell running her own catering company followed, then a move to Switzerland, the home of the hospitality industry. Alexlouise catered to exclusive ski chalet clients like Prince Andrew, the President of Kazakhstan, the Saudi royal family, and billionaire businessmen and women. When she returned to Wales, she began working at her other love, property development. Cooking went on the back burner for a while, but her love of food eventually drew her back to the kitchen. She started her Alex’s Supper Clubs business, where a group of people visits her base in Pontypridd, each bringing an ingredient. Everyone cooks together. Then came Alex Cooks The Box. Now, Alex is also spreading her love of cooking by teaching families how to cook with affordable, fresh ingredients in Llanhilleth. Maria Williams is a professional blogger, copywriter, and PR for small businesses. Go to www.wordsyoucanuse.co.uk. 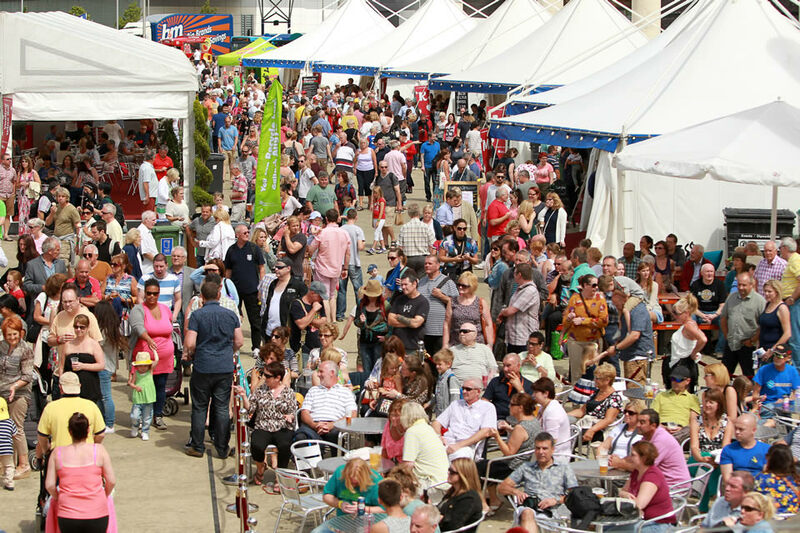 AROUND 60,000 food fans are set to descend on Cardiff Bay this weekend. The annual Cardiff International Food & Drink Festival will feature eating, drinking, live music and entertainment. Fire Foods Ralph’s Cider and Perry The Original Welsh Oggie Pie Co.